Off Receive your notifications daily by email. You don't belong to any groups yet. Go ahead and join a group now! Contribute your expertise and knowledge. Join a group and make your voice heard! Are you sure you want to delete your profile? All of your information will be removed. To find your Twitter user name, log in to your Twitter account and locate the text shown in the red box below. This is what you should enter into your TRI profile, without the @. 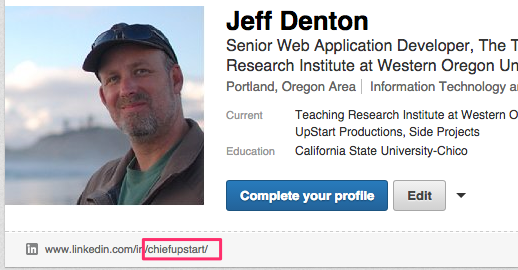 To locate your LinkedIn public profile name, log in to your LinkedIn account and go to your profile page. The portion of the LinkedIn Public URL located in the red box shown below is what you should enter into your TRI profile.